I stumbled across this image the other day whilst out roaming and the juxtaposition of it made me grin. 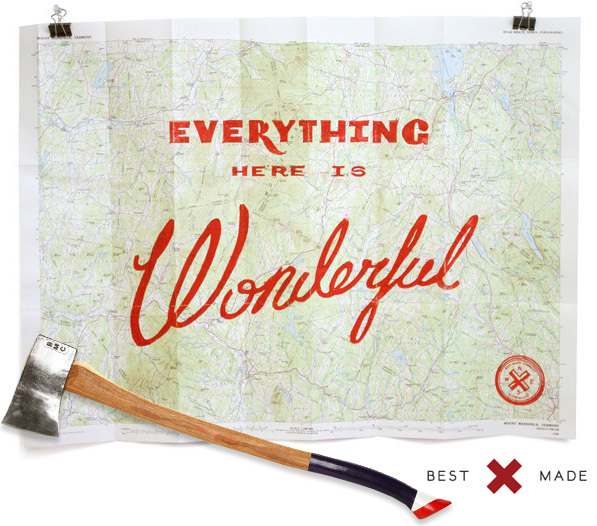 “Everything Here Is Wonderful” is a limited addition map print from the NY based axe makers, Best Made Co, they created a “Limited edition of 15 woodblock prints on topographic maps from the United States Geological Survey. Handmade at the Best Made Outpost in St. Paul, MN.” With three maps currently available, you can choose from Mt Hood, MN, Mt Mansfield, VT, and Marfa. I want it, I only wish there was an UK one.